Pervenche Berès has been a Member of the European Parliament since 1994. She is currently the Socialists & Democrats Coordinator of the ECON committee and a full member of the Committee on Economic and Monetary Affairs. She also serves as a substitute member on the Committee of Industry, Research and Energy and on the Committee of Institutional Affairs. In 2014, she headed the commission reporting on economic governance framework of the EMU and in 2015 on the budgetary capacity for the Eurozone . In European Parliament elected in 2009, she was the Chairwoman of the Employment and Social Affairs Committee and a substitute member in the Economic and Monetary affairs committee. Prior to that, she was Chairwoman of the Economic and Monetary affairs Committee (2004-2009), Head of the French socialist delegation (June 1997-June 2004 & June 2014-January 2017) and Vice-President of the Socialist group in the European Parliament (June 1997-June 2004). From December 1999 to October 2000, she was the Vice-president of the European Parliament delegation to the Convention in charge of elaborating a European Union Charter of fundamental rights. She was also a member of the European Convention in charge of drafting a Constitution for Europe from February 2002 to July 2003. 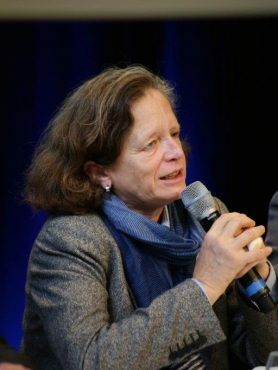 Pervenche graduated from the « Institut d’Etudes Politiques » in Paris and was until 1994 an administrator in the French National Assembly with a brief hiatus from 1988 to 1992 where she acted as an advisor for International and European affairs to Laurent Fabius, President of the National Assembly. Quel impact des révolutions sur les inégalités ?